The army traces its heritage back to the 1st Tank Army, formed twice in July 1942 and in January 1943 and converted into the 1st Guards Tank Army in January 1944. The army fought as part of the Red Army on the Eastern Front during World War II. The army was commanded throughout most of the war by Mikhail Katukov. It fought in the early defense during the Battle of Stalingrad, and Operation Uranus, also participated at the Battle of Kursk, Proskurov-Chernovtsy Operation, Lvov-Sandomierz Operation, Vistula-Oder Offensive and the Battle of Berlin. After the war, the army was stationed in East Germany as part of the Group of Soviet Forces in Germany. After the end of the Cold War and the resultant withdrawal of Soviet units in Germany, the army was relocated to Smolensk, disbanded in 1999. The army was reformed in 2014 as part of a Russian military expansion. The 1st Tank Army was first formed within the Stalingrad Front from 38th Army in July 1942, under the command of Major General Kirill Moskalenko. The army was encircled and partially destroyed, and was disbanded as a result in August 1942, its headquarters becoming the Southeastern Front headquarters. The 1st Tank Army was formed a second time on 30 January 1943 (order No.46021) from the headquarters of the 29th Army, under the command of famous armoured troops commander Lieutenant General of Tank Troops Mikhail Katukov, personally appointed by Stalin. The army was transferred to the North-Western Front. 3rd Mechanised Corps (later to become 8th Guards Mechanised Corps) and 6th Tank Corps (later to become 11th Guards Tank Corps) joined it on formation, and served with the army throughout the war. It was quickly transferred to Voronezh Front for the defense of the Kursk salient's southern shoulder. It was awarded a Guards title and became the 1st Guards Tank Army in April 1944, and Katukov was promoted to Colonel General. * Guards Mortar Regiment (or Battalion) (Russian: гвардейский минометный полк (дивизион)) was the overt designation used for Katyusha rocket launcher units. It participated in the Battle of Kursk, the Lvov-Sandomierz Operation, the Vistula-Oder Offensive, and the Battle of Berlin. 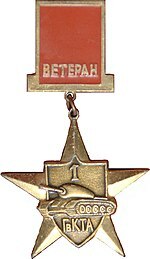 The 1st Guards Tank Army was awarded the Order of the Red Banner postwar, and became part of the Soviet occupation force in Germany, known as Group of Soviet Forces in Germany, with its headquarters in Dresden. In 1968, it, along with the 11th Guards Tank and 20th Guards Motor Rifle Divisions, took part in the Soviet invasion of Czechoslovakia, but then immediately returned to their respective garrisons. In the late 1980s the Army included the 20th Guards Motor Rifle Division, 9th Tank Division, and 11th Guards Tank Division. The headquarters was withdrawn to Smolensk, in the Moscow Military District in the early 1990s, and lost the 'Tank' from its title in 1995. In its last period within the Russian Army it comprised the 4th Guards 'Kantemir' Tank Division and the 144th Motor Rifle Division (which had been withdrawn from Tallinn in Estonia). It was disbanded in 1998. After a 15-year break, the Army was reconstituted in November 2014, seemingly on 13 November 2014. The army was formed as the main ground forces manoeuvre and reserve operational formation of the Western Military District in addition to the 6th Combined Arms Army (headquartered in Saint Petersburg) and the 20th Guards Combined Arms Army (headquartered in Voronezh). It is considered the elite of the Russian Ground Forces. The army carries on the traditions of the chronologically first army of the Soviet Union to reach 'Guards' status. Further it has the 2nd Motor Rifle and the 4th Tank guards divisions, which are considered the elite formations of their respective combat arms. The most decorated divisions of the Soviet Army, they were garrisoned the closest to Moscow. Due to their proximity to the capitol their personnel was put to extra scrutiny, they were considered a very prestigious posting, received the latest hardware and thus known as the 'household' divisions of the Soviet Army. Their loyalty to the regime was demonstrated by their involvement in the 1991 Soviet coup d'état attempt. The divisions retained their elite status within the Russian Army. ^ "ВЗГЛЯД / Россия закрывает "черную дыру" на границе с Украиной". vz.ru. ^ Defence, Russia. "Russian Army: Military districts, units (Locations, equipment and re-armaments)". Russia Defence Forum. Retrieved 20 May 2017. ^ "В состав танковой армии Западного военного округа войдет новый инженерно-саперный полк : Министерство обороны Российской Федерации". function.mil.ru. Retrieved 2018-10-02. ^ сборник, БАСТИОН: военно-технический. "ВООРУЖЕНИЯ, ВОЕННАЯ ТЕХНИКА, ВОЕННО-ТЕХНИЧЕСКИЙ СБОРНИК, СОВРЕМЕННОЕ СОСТОЯНИЕ, ИСТОРИЯ РАЗВИТИЯ ОПК, БАСТИОН ВТС, НЕВСКИЙ БАСТИОН, ЖУРНАЛ, СБОРНИК, ВПК, АРМИИ, ВЫСТАВКИ, САЛОНЫ, ВОЕННО-ТЕХНИЧЕСКИЕ, НОВОСТИ, ПОСЛЕДНИЕ НОВОСТИ, ВОЕННЫЕ НОВОСТИ, СОБЫТИЯ ФАКТЫ ВПК, НОВОСТИ ОПК, ОБОРОННАЯ ПРОМЫШЛЕННОСТЬ, МИНИСТРЕСТВО ОБОРОНЫ, СИЛОВЫХ СТРУКТУР, КРАСНАЯ АРМИЯ, СОВЕТСКАЯ АРМИЯ, РУССКАЯ АРМИЯ, ЗАРУБЕЖНЫЕ ВОЕННЫЕ НОВОСТИ, ВиВТ, ПВН, информация по военной технике, сайт по Военной технике". bastion-karpenko.ru. Retrieved 2018-10-02. ^ Military personnel of the Soviet Armed Forces, assigned to service in a guards units or formations, added to the particular rank designation the wording Guard …, e.g. Guard Lieutenant General. This tradition is continued in the Russian Federation. Duncan, Andrew 'Russian Forces in Decline – Part 3', Jane's Intelligence Review, November 1996. Glantz, David M. 'Companion to Colossus Reborn' University Press of Kansas, 2005.